It’s been an interesting couple of days around my house. I have the world’s happiest most miserable teether…. 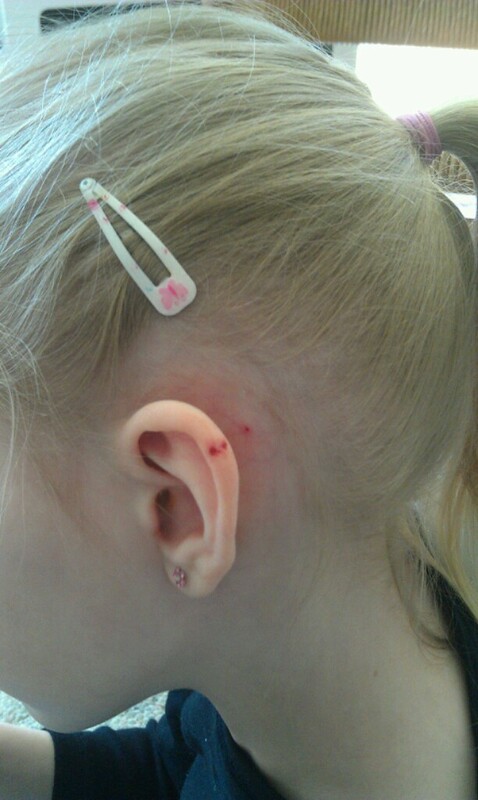 And my 4 year old was trying to get the eraser off her pencil, and using force only a 4 year old can muster, pulled so hard that when the eraser finally let go she literally poked a hole through her 7 year old sister’s ear (it was a newly sharpened pencil). So, she had an entrance and exit wound, and a hole in the side of her head. 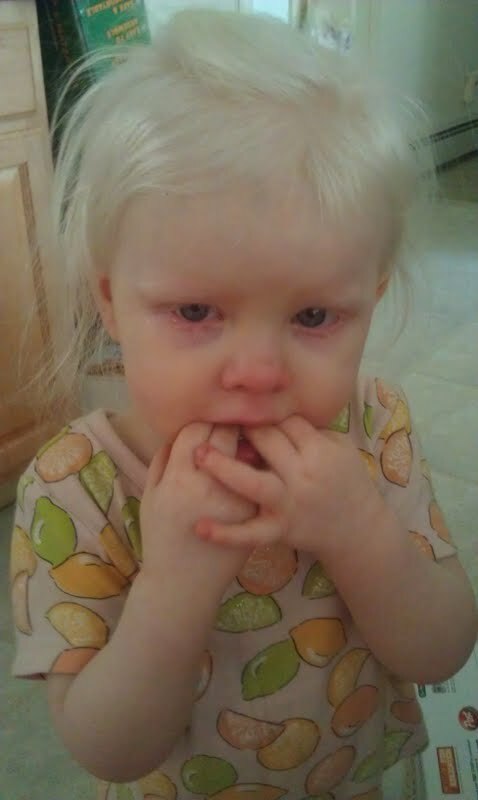 We later joked that those are the dangers of homeschooling, because in public school you would have more space between you and your neighbor….. :) She’s fine! The daughter that inflicted the pain cried more than the daughter that was injured. She felt SO bad! The doctor’s office told me, never in 30+ years have they heard an injury like that. The joys of children. I’m just very grateful it wasn’t her eye! Ok, so back to our scarf….. 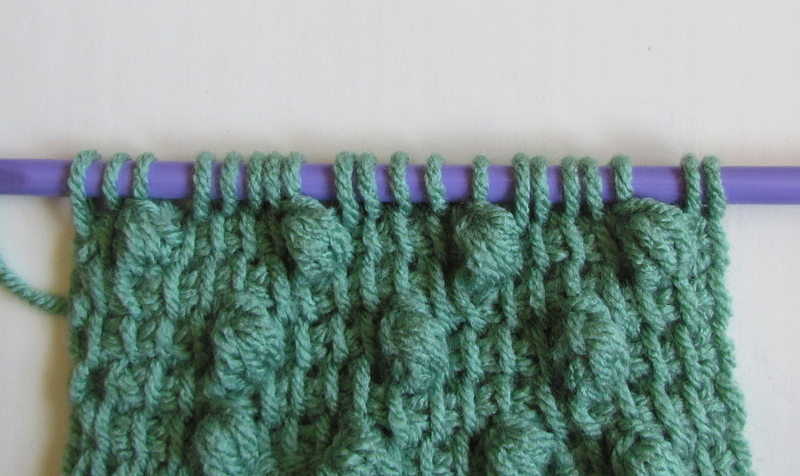 I love adding texture to my pieces, so let’s try the puff stitch. 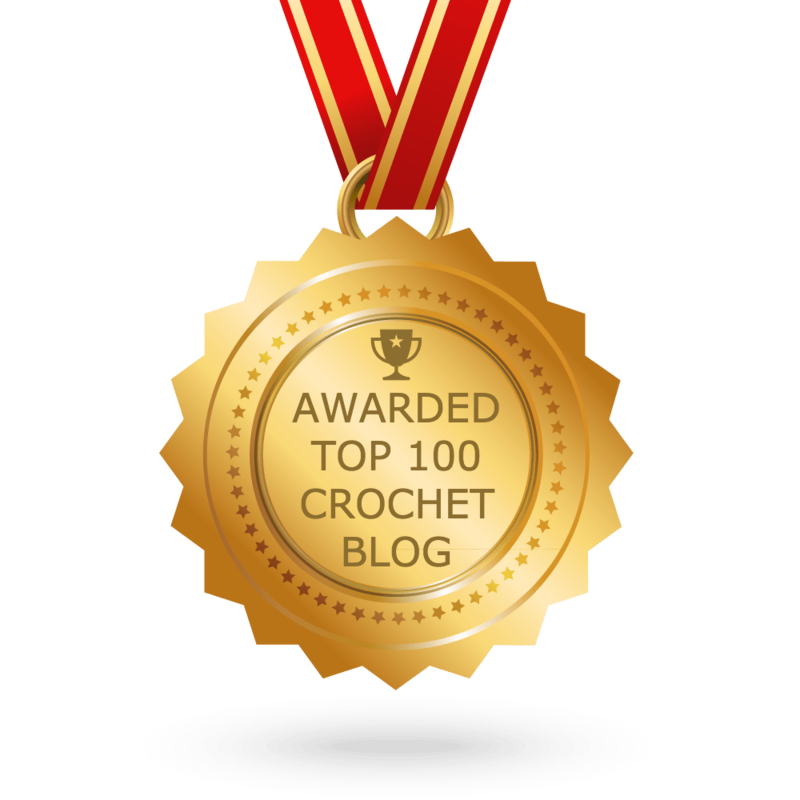 It is worked by grouping stitches together so they puff up. 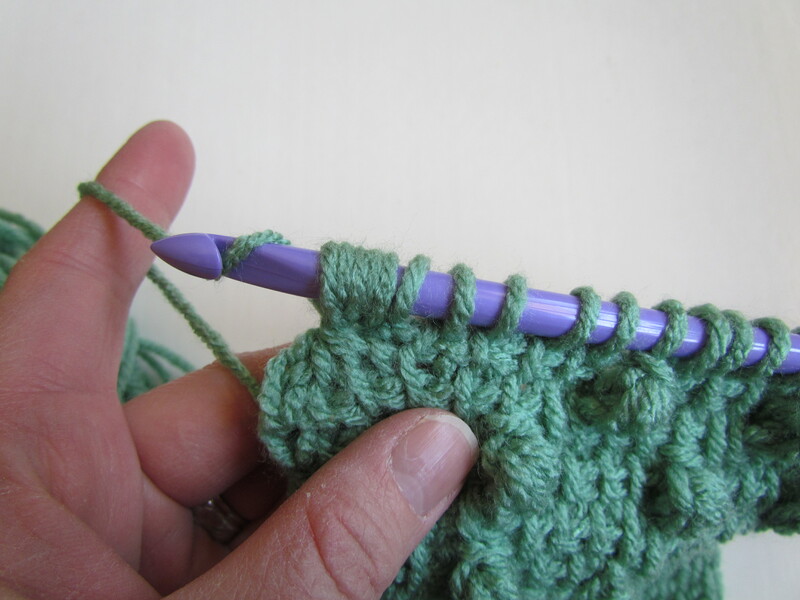 To create the puff stitch, you start a bunch of stitches and then finish them all off together. 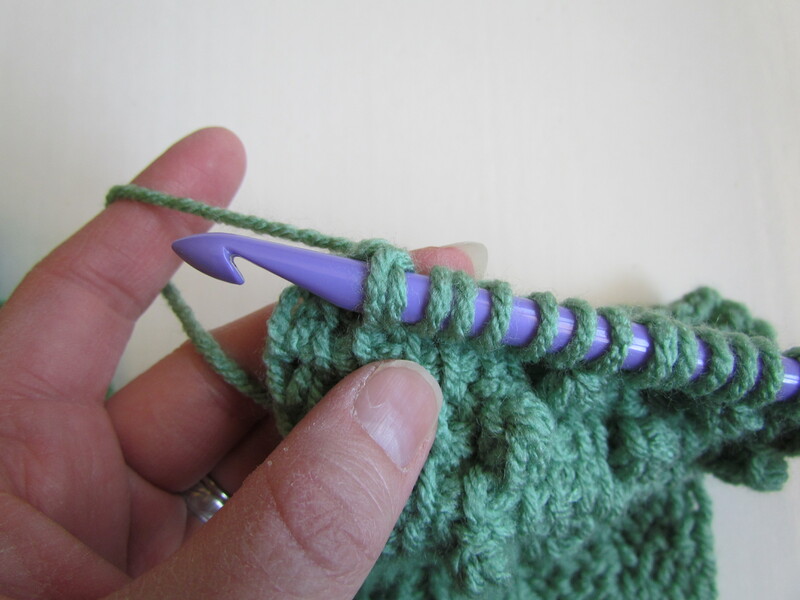 Puff Stitch – yo, insert hook behind both loops of next st (see fig.1), yo, pull up a loop, (yo, insert hook behind same st, yo, pull up a loop) 2 times (see fig.2), yo, pull through 6 loops on hook (see fig.3), ch1. Row 52: skip 1st vertical bar, TSS across row. Row 53: skip 1st vertical bar, TSS (from section 1) in next 3 sts, * puff st, TSS in next 4 sts, repeat from * across working last stitch through both loops. Fig.2 – (yo, insert hook behind same st, yo, pull through loop) 2 times. 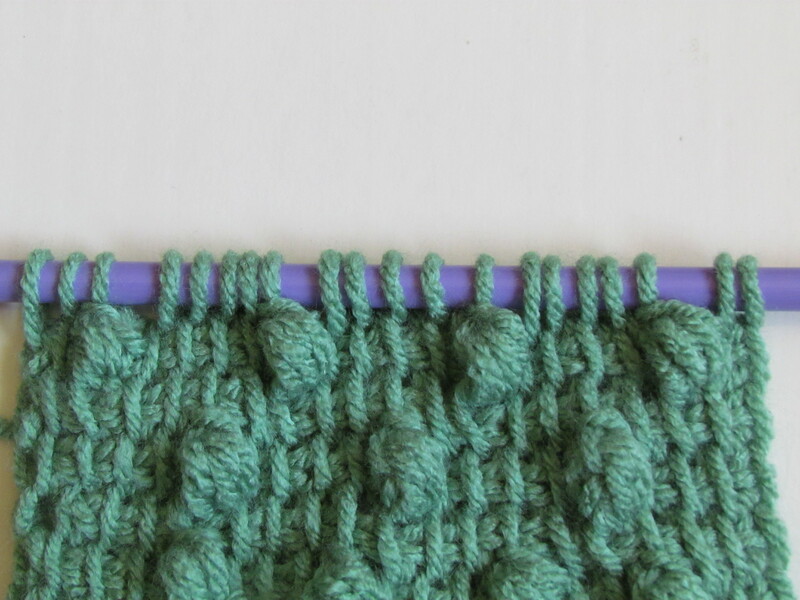 Yarn over, pull through 6 loops on hook. Row 54: skip 1st vertical bar, TSS across row. Row 55: skip 1st vertical bar, TSS in next st, * puff st, TSS in next 4 sts, repeat from * across working last stitch through both loops. Row 56: skip 1st vertical bar, TSS across row. Row 57 – 60: Repeat Rows 53 & 56 one time. I had a hard time getting good pics of each step (it’s not easy trying to take a pic of “yo, pull through 6 loops”. lol If you think you need more help, or better pics, let me know and I’ll see what I can do.